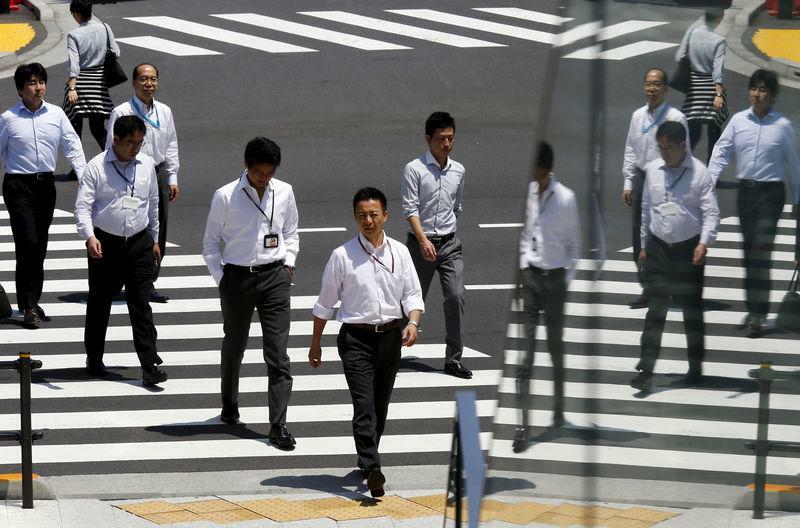 TOKYO (Reuters) - Japan's plans to implement more employee-friendly laws are set to prove painful for many companies, with half saying labor costs will rise and two-thirds considering ways to lift productivity to offset the impact of the reforms, a Reuters poll showed. Prime Minister Shinzo Abe's government last month endorsed an action plan for sweeping reforms of employment practices, including caps on overtime and better pay for part-time and contract workers. The proposals, which may come into effect from 2019, will only add to strains already being felt as firms grapple with a deepening labor shortage due to a rapidly aging population. That said, more pressure to boost productivity is seen as long overdue and could boost growth in the long-term. "Coming on top of labor shortages, Abe's plan will cause declines in sales and profits. We have done what we can in terms of streamlining," wrote a manager at a machinery maker, one of the nine percent of firms which saw a considerable jump in labor costs. The Reuters Corporate survey, conducted April 4-17, showed 41 percent saw costs rising somewhat, while 38 percent expect no change and 11 percent forecast that labor costs will decrease. The impact of Japan's labor shortage is already pressuring earnings at some firms, and at others, management has found it no longer has the bargaining power it used to have as failure to reward employees sufficiently can result in less staff. Convenience store chain Lawson Inc <2651.T> last week forecast its first decline in annual profit in 15 years, due in part to investments in new technology that will help it cope with fewer workers. And this week, delivery service firm Yamato Holdings Co <9064.T> slashed its profit estimates for the financial year just ended by almost half, saying it needed to pay unpaid overtime for the past two years. Service sector firms - which include labor intensive industries such as retailing and construction - are the most vulnerable. Nearly 60 percent of non-manufacturers polled in the survey said costs will increase. The survey, conducted monthly for Reuters by Nikkei Research, polled 529 big and mid-sized businesses. Around 240 firms, which reply on condition of anonymity, answered the questions on labor. Japan's working-age population shrank to 77.2 million in 2015 from a peak of 87.2 million in 1995 and is forecast to fall further to 45.2 million by 2065. At the same time, Japan - the world's third-largest economy - ranks higher than many other advanced economies in terms of annual total working hours per worker, while its per-capita GDP undershoots most of them, government data shows. "The government wants companies to seize this opportunity to raise productivity to cope with labor shortages, and many firms appear to share the objective," said Hidenobu Tokuda, senior economist at Mizuho Research Institute, who reviewed the survey results. Public outrage over long working hours has also motivated Abe to make labor reform a key policy plank. The suicide of a young worker at advertising agency Dentsu Inc (4324.T) in 2015, later ruled by the government as 'karoshi' or death by overwork has only fueled momentum for reform. In addition to legal caps on excessive overtime that would carry penalties for infringements, Abe's action plan calls for better pay for part-time and contract workers, with the government noting that around 40 percent of Japanese workers are 'non-regular' workers and are paid far less compared to other advanced countries. Investing in technology - from new computer systems to artificial intelligence, robots and the internet of things - was the most cited method of boosting productivity in the survey. But implementing this could be easier said than done. "One problem is that Japanese firms are short of talented workers in the fields of IT and AI," said Tokuda. Firms also said they would introduce flexible work schedules, cut down on internal meetings and train employees to multitask more.